I love this. Polishes up a tunic and leggings for a more professional look. Soft material,and washes well. I received many compliments on this vest, and questions about where I ordered it. 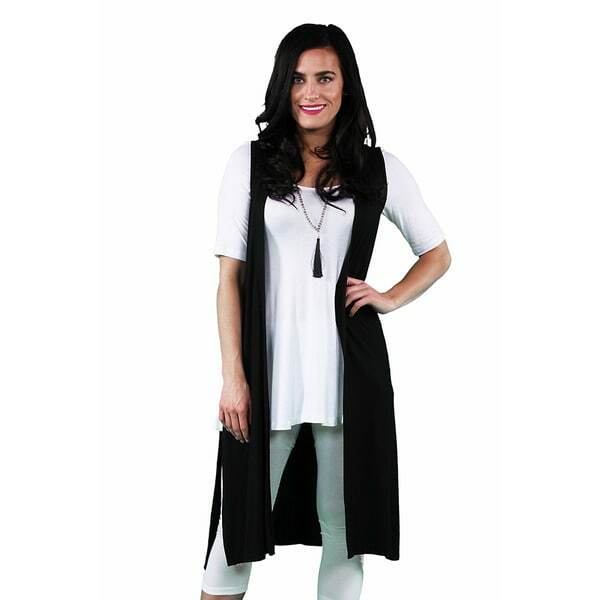 Perfect on top of your best blouse, this sleeveless long shrug from 24/7 Comfort Apparel is sure to give you that extra fashion pop this spring. With an even flowing design, side slit, and a no clasp open front, this piece is sure to become one of your casual fashion favorites. Love the sleeveless long shrug. I bought a medium which I always get and it was too small across the bust. I gave the shrug to my daughter and she loves it . I just ordered the large for myself. You can dres this up or done and it adds flair to whatever you wear. I ordered this item in multiple colors. It's a great fit. The cardigan washes well--holds its color, shape, and general appearance. It holds up well in the dryer also--no matter the temperature. Once more colors are available, I will order them. The cardigan looks well with long-sleeved, short-sleeved, and no-sleeved shirts and blouses. What a find! Great product, great price! Sizing is a little off. Order bigger!! Very nice vest. Quality material. I have worn this on many occasions and it has held up in the wash, no color has bled from it. it still looks nice. Absolutely beautiful. Very good fit. Would definitely recommend this item to others. I am 5'3 and I had to order a large. It's a little long but I still like it. "I'm shorter and i usually wear a large in shirts. Trying to decide if the large would be to long though??" Looks comfy and goes to all season to add to your style in any occasion. I can put this over, wearing short and small top shirt on, skinny jeans or casual. This apparel can do so much and goes to any daily clothing you wear. A wonderful addition to compliment any dress, or Jean outfits. "is it true to size?"